Interesting: From the Sky to the Earth!! Across the woods, two soldiers were walking down a road amidst all the shooting going on around during the World War II. Suddenly they heard a noise. The lieutenant heard that and got alerted and got into cover behind some bushes and was watching for the source of sound. They heard another sound and another. Then he realised that they were foot steps. That was keyword the US soldiers used to distinguish between friend and foe during the World War II. Obviously, the flash or lightning comes before the thunder. And many times they are very destructive. What may seem unbelievable was that about 3000 people died because the lightning struck the base of the church that contained gunpowder. But the most interesting is the fact that 31 cows died because of a single lightning strike... Whoa. There have been numerous air crashes resulting in a large amount of casualties. Few years back I saw this small story in "Young World" published by "The Hindu". A soldier was struck by a lightning. He regained health. Again the lightning struck him. This time he quit the job. Then one day when he was going on his horse, the lightning again struck him leading to his death ultimately. Two years later, lightning struck his tomb and shattered it. Poor fellow!!! 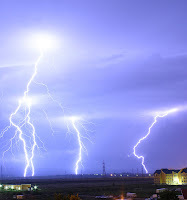 Many of us know that lightning is the electrical discharge and thunder is the sound produced when lightning is produced. But what marvels the scientists is what causes them. It’s obvious that the clouds should emit charged particles to produce a lightning. But the real question is what makes the cloud to emit the charges. But as far the research can go no one can give a conclusive fact with evidence on the real cause of the lightning and thunder. What science can answer is how Lightning starts and not how clouds get ionised and what the weather and geography has to do with it etc. Typically when a cloud reaches a mountain or hill station it is called fog. If they acquire charge then why aren't hill stations affected by this phenomenon? And at times lightning goes towards the earth? what makes it to gotowards earth? is the earth's surface charged??? And how does ice crystals get charged up automatically? Though science can explain them, they cant provide conclusive evidence on all aspects surrounding lightning and the loud thunder!!! Well... according to my limited knowledge it is static electricity which causes this. Like when u run a comb through ur hair it gets charged up. And when u take it close to any small object it causes an attraction due to polarization. U might even be able to see small sparks flying. When same thing is applied to large objects obviously they cant move. So what moves is a large amount of electrical energy or electrons. The transfer is initiated after a certain threshold point beyond which the charges cant be held. Ahem, As far as i have read, this is electrostatic induction between the positively charged clouds and the negatively charged earth's surface with air as a medium of discharge. And the airplanes struck by lightnings must be the 'Action of Points' funda. And yes, the visual thingy is because of the air particles getting heated up. "But the most interesting is the fact that 31 cows died because of a single lightning strike.."
Well... the earth is -vely charged and the clouds +vely... and the fact that the electrons are lighter implies that they wud hav to move towards the +vely charged particles... and not vice versa..!! ahh well.. i guess so..! well the earth to sky funda basically depends on certain factors da. for example when u r launching a satelite this type of lightning is caused. these are most probably caused by some artificial issues.